Ideas For Attracting Robins Using Trees, Shrubs and Providing Food. Attracting Robins to nest in your yard, or just because you enjoy watching them can be done many different ways. Understanding what plants, nesting sites, and food that attracts these birds will increase your chances of having Robins in your backyard. 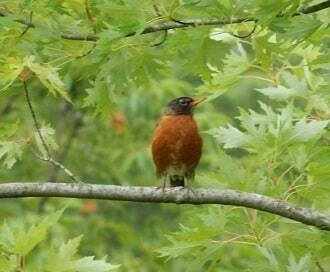 The diet of the Robin does not include seeds, they prefer earthworms, and insects such as termites, and grubs. Also included in their food preferences are fruit and berries. Try placing raisins, suet, strawberries, grapes, and currants on a fruit feeder hung from a pole or attached to a tree. Providing a source of water is one of the surest ways of attracting Robins to your backyard gardens. A birdbath will attract a wide variety of birds that don't normally visit your feeders. Make sure to keep the water and birdbath clean. Certain plants will draw more of these birds to your yard. Consider planting fruiting plants such as bayberry, pyracantha, and grapes. Fruiting trees that provide food for Robins are crabapple and cherry. Robins were forest-nesting species but over time they have become especially adapted to cities and open areas. They now commonly nest in gardens and parks although they can be found in just about any type of habitat, apart from swamps and marshes. Attracting Robins to nest near your home can be done by providing nesting shelves placed under overhangs of buildings and barns. These birds can be found nesting in various places such as downspouts, electric meters, or any ledge type platform. Traditionally they nest in the fork of a tree or dense shrub 3 or more feet above ground. Providing a muddy area will aid in attracting them to nest near you. The female uses mud to build the nest. A favorite way to do this is to take an old trash can lid, turn it upside down and fill with dirt and water.